Last week I mentioned the outrageous number of artists who had to work on Yuri!!! On ICE’s finale so that it could be finished in time. The general reaction seemed to be of bewilderment as people realized just how messy the situation had become, but I also noticed confused outliers; people who simply lacked any frame of reference, and even some who thought that multitude was something positive. It’s time for some research into how many animators it takes to produce an episode of anime nowadays. 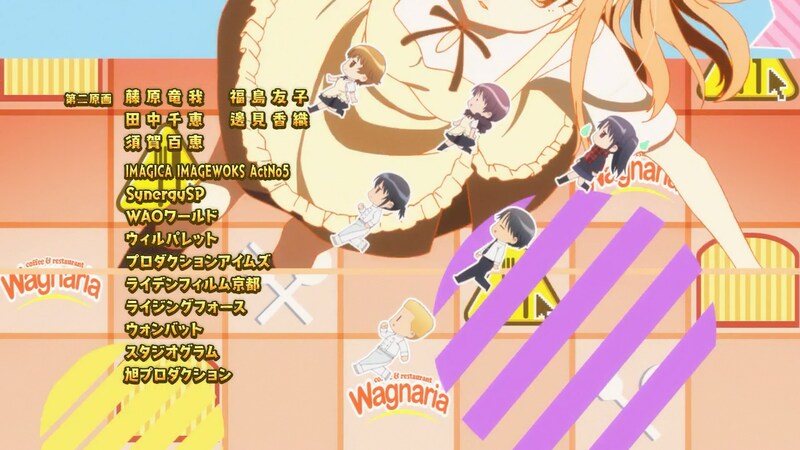 Before delving into the data, we’re going to need some disclaimers and tips to help people understand this post and how the anime industry works. For the most part, less is more. Abundance of key animators and animation directors is a bad sign that hints that there was very little time to get the job done, thus it got split into ridiculously small chunks for tons of artists to work on. This has been anime’s response to the unsustainable levels of overproduction seen nowadays, which is why credit lists have greatly increased in length. There are exceptions of course – specialized animation directors inflating lists, inherently more animation-demanding projects, high profile productions with tons of supervisors… Just keep in mind that noticing tons of animators credited is a very worrying symptom, especially if it’s a recurring issue. Another important detail: most creators working on an anime episode are explicitly named, but this data is incomplete, and we’ll never have access to its entirety. That’s because we often see studio names with no specification of which artists worked on it mixed in with the regular credits. When it comes to animation directors this isn’t a problem, but I had to ignore a couple of series because the number of key animators explicitly credited was clearly unrepresentative, and it’s otherwise an issue plaguing pretty much all shows. The entire point of this is to give you a general idea of the scope of productions though, so I considered it a necessary evil. And while we’re on inherent numeric imperfections: don’t obsess over the exact numbers! The exact figures don’t really matter, especially knowing they’re incomplete. All projects aren’t managed the exact same way, and they definitely don’t have the same needs. 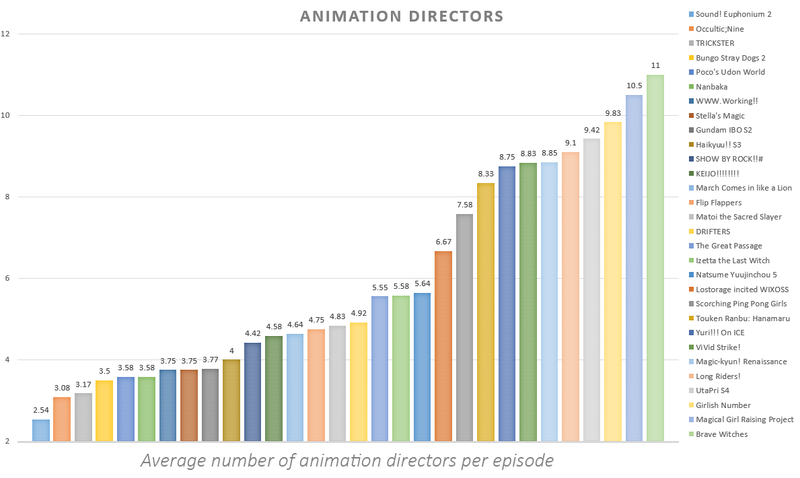 Getting a sense of scale and realizing the consequences the industry’s problems cause should be the goal here; a project that averaged 5 key animators more than one of its peers won’t necessarily have struggled more, but if it’s 5 animation directors more then it definitely did. I’ve already delayed this enough, so here’s the spreadsheets with the data. If your gut reaction is that it’s a lot, you’re on the right track. This fall season has been unusually filled with delightful animation, but it’s also suffered more production issues than ever – and that is evident in these numbers. You shouldn’t assume that series hovering around the middle in these tables are what an average project is meant to be. Checking a handful of 2007 TV anime – right after the industry’s previous peak – resulted in very varied data, but ultimately seemed to average around 20~50% less than the figures I obtained by analyzing the current season. I might eventually chart enough historical data to properly chart the evolution of the anime industry, but it’s clear that the number of artists required is trending up in a dangerous manner, especially as the pool of creators doesn’t really increase. If we look at this season’s shows individually, the correlation between troubled productions and very high number of animators checks out. Yuri!!! 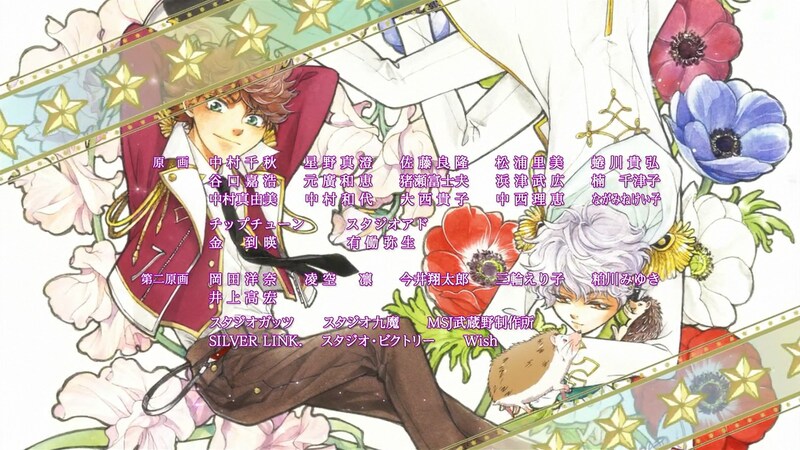 On ICE stands out as the series requiring the most animators by far, and at this point its struggles are no secret. Flip Flappers following it also makes sense – not only is it an animation-heavy project, but it also wasted its lead time and is now having a very hard time to bring the project to an end. You might also be surprised by the amount of red on that chart, marking all the incomplete credits; only Euphonium credited all of its key animators this season, while a couple shows like Haikyuu! !, Matoi and Keijo (though that one with notorious caveats) got fairly close. For the most part though it seems obvious that the real figures are quite higher, easily averaging +10 over the explicit credits; the nasty production decay isn’t properly reflected by the numbers in some instances, as the number of studios listed heavily increases but without details as to how many workers that entailed. Chances are Yuri!!! On ICE’s finale actually required over a hundred key animators, but we’ll never know that for a fact. The animation directors chart might be more telling though, especially its per episode evolution. The production health and results are coherent once again. The series that have suffered delays and needed to push back its disc releases like Brave Witches and Long Riders unsurprisingly hang out at the bottom, while polished work like Occultic;Nine and Bungo Stray Dogs generally stays around the top; the progression of these two is particularly interesting as they started with very low numbers and feature clear breaking points when the schedule catches up to them, but thankfully that occurred late enough for them to finish peacefully. 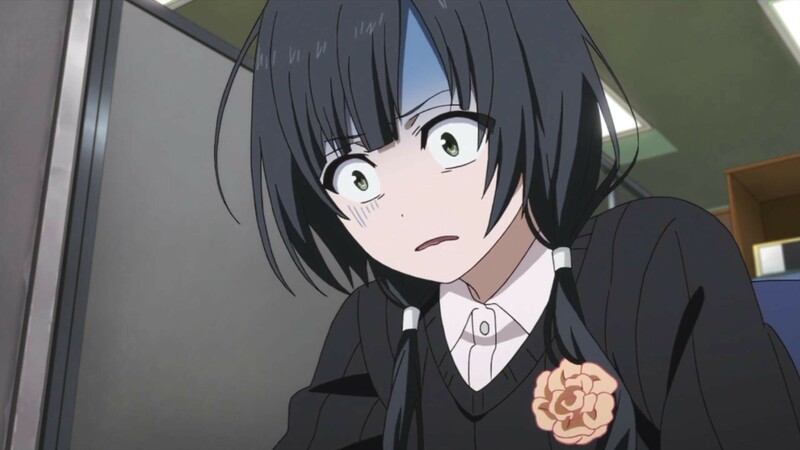 A similar case would be Flip Flappers, though this time with less of a happy ending – the show was confirmed to be very ahead in its production and the small number of supervisors early on lines up with that, but eventually something must have gone wrong and it’s having a bit of a rough landing. In the end, does this present a solution? Perhaps yes, though not a feasible one. Euphonium clearly stands out from everything else, requiring far less artists than anything else yet resulting in a very impressive production. And this is far from an outlier for KyoAni – if anything this is one of the heavier projects at the studio, which still gets to average key animators in the single digits and doesn’t usually have a role like Euphonium’s Instrument Animation Director to raise the final sum. Achieving the same level of quality wouldn’t be a given, but this does tell you that if you don’t spread resources way too thin, anime episodes only require a handful to a dozen of animators. If you’ve paid attention to anime credits from a few decades ago, you’ll know that things used to work that way to begin with. Though of course, simply asking the industry to limit its production and assuming that would immediately solve all problems with no negative repercussions is naïve at best, which is why I said the solution this data hinted at wasn’t a magical one. But that’s a topic for another day! Support us on Patreon so that we can keep producing all this content and fullfill our next goals, as well as affording all server expenses. Thanks! Occultic;Nine also had a solo key animation episode (Nishii aiding Ishiguro again, but that also had 2nd KA so no ‘clean’ one this time in full length anime. And yeah, the levels that would have been considered exceptional back then have now become the norm. Great article, Kevin. (and great pun, too). I just to wanted to ask, which are exactly those resources you mention by the end of the post? Human resources, but also the companies they’re attached to. There’s only so many projects the industry can output while ensuring a certain level of quality and production sanity. If half your freelancers have little time because they already have to worry about the next 2 projects where they’ll also have to rush, things will go wrong. This really underscores the importance of good project management. Having people on staff rather than relying on freelancers can really contribute to this because you know who will be available and when. Also, much like in software, it seems that just throwing more people at a project already in progress doesn’t really speed it up much if any. The key animators chart is now very slightly off since only 6 people worked on Euphonium’s finale and lowered that median to 10. Would this be prohibitively time consuming to do on a consistent basis for every season? I absolutely loved the statistics, and would love to see something like this for every major show each season, but I understand if that’s just not feasible, as well. It does take time, but this site is already maintained by doing more work than it makes sense and I like the idea so chances are that you’ll see more of this. Well hopefully that amount of work pays off eventually. You guys are invaluable. I wish the demand was higher than it is and I look forward to more stuff like this. Very nice analysis but that second chart is really, really hard to read.